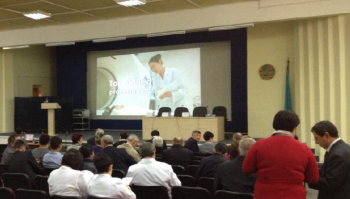 According to Ministry of Economy, Trade, and Industry’s strategy in 2012 to promote the medical equipment and services in overseas, Med in Japan participated in the “Seminar for Japanese-Kazakhstan Medical Exchange Promotion” on 23rd October 2012 at auditorium of Kazakh Scientifically Research Institute of Oncology and Radiology, Ministry of Healthcare of the Republic of Kazakhstan. The seminar was well attended by 120 participants. The Japan-Kazakhstan medical exchange Seminar is expected to be arranged in the future.